The Sine Bar can also be used to measure small angles off of plumb. 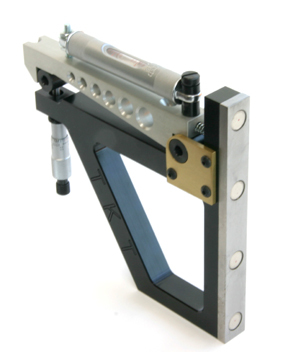 The micrometer adjustment that measures the angle corresponds to 0.087 inch for 1 degree. This is useful when tilting canter vertical press rolls forward 1/2 or 1 degree. 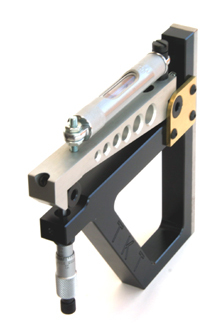 The Sine Bar comes with instructions for setting bandsaw guide pressure without having to drop plumb lines. 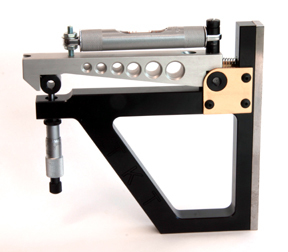 The procedure is to measure the angle of the bandsaw between the guide and the wheel. With the Sine Bar, guide pressure can be checked in a matter of minutes. Another use for the Sine Bar is for calculating how much shim is needed to make a surface plumb. The Sine Bar measures angles as the reading on the micrometer divided by 5 inches. So, for example, if the Sine Bar reading on an anvil is 0.010" and the anvil is 15 inches height, then a 0.030 inch shim is needed to make the anvil plumb. This tool eliminates guessing! The Sine Bar is an extremely useful measuring tool for aligning and maintaining sawmill equipment. The Sine Bar is a basic alignment instrument for every sawmill. © 2019 TKT Engineering Inc.